Georgetown is one of those truly interesting must-see places. 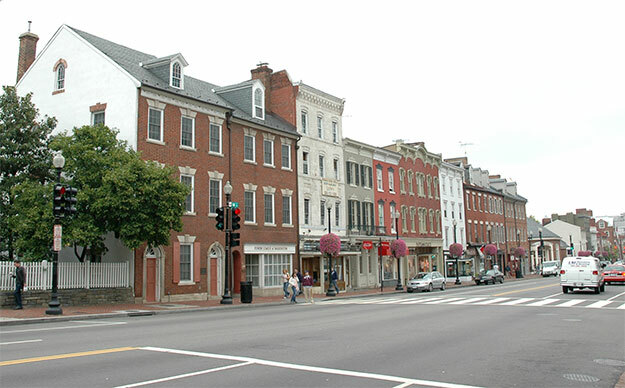 It’s a historic river town graced with architectural elements of every era since its 1751 founding, and has the long-standing distinction of being the most fashionable district in Washington DC. It has it all, charming graciousness, gorgeous historic townhomes and rowhouses, wonderful shops and culinary hot spots, both old line and nouveau. An engaging way to see what lies behind the elegant façades of residences and restaurants is on a walking tour that seamlessly combines history and architecture with wonderful culinary tastings. The Gastronomic Georgetown Food Tour does just that. Pleasant, engaging, well-informed tour guides lead the way along the 3.5 hour walking and tasting tour revealing the fascinating layers of this well-connected historic river town with an upscale charm and the feel of the Left Bank of Paris. The walk moves at an easy pace down cobblestone streets lined with architectural gems: Georgian townhouses, early Federal and Classical Revival houses, antebellum homes, Victorian era row houses. The guides point out historic homes holding stories of Washington’s past, and residences of modern-day notables. The tour passes elegant storefront boutiques and charming shops tucked into tiny spaces; by sidewalk cafes, upscale delis, chic coffee shops, and amazing bakeries in a town where the art of cupcake making is a competitive sport. Restaurants are everywhere, from high end hot spots to old line favorites. Artisanal eateries serve Mediterranean, Turkish, Italian, Moroccan, Japanese, Vietnamese, American and yes, French cuisine, plenty of it. With the culinary arts being such an integral part of present-day Georgetown, the gastronomic parts of the tour are eagerly anticipated. There are four pre-selected tasting stops spaced along the tour. All are favorite, locally owned establishments. Stops may include a classic Italian restaurant featuring hand-made pasta, a family-owned French bistro serving specialties from southern France, a critically acclaimed restaurant specializing in Presidential favorites, or handcrafted beverages in a European influenced coffeehouse.. There is a sweet ending to the engaging, interesting and fun tour. To get the tasty treat and a pleasant drink, the tour crosses yet another piece of Georgetown history: the historic C&O Canal! Rich in history, sights and food. Engaging. Interesting. This is a satisfying way to experience Georgetown.